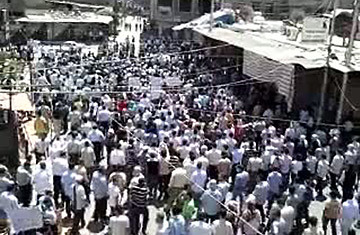 An image grab taken from a video uploaded on YouTube shows hundreds of Syrian anti-regime protesters rallying in Duma, a suburb of Damascus, following Friday noon prayers on August 12, 2011. It was 9.30 p.m. on Friday last week, and the Syrian capital Damascus was a ghost town. There were few cars on the streets, and even fewer families enjoying the warm Ramadan evening. Still, the streets were not completely deserted; Groups of men, hundreds of them, waited in many of Damascus's neighborhoods. They disgorged from buses and congregated outside mosques and along main roads. Some sat on the sidewalk; others stood near roundabouts; most were armed with some sort of weapon  a rifle, a wooden truncheon, an iron bar. The men  some of whom wore mismatched items of military clothing, others civilian garb or simply black clothing  are commonly known as shabiha, the armed thugs that anti-regime activists say President Bashar al-Assad has used to buttress the bloody efforts of his official security forces. It was a frightening show of force, intended to intimidate worshippers coming out of the city's mosques after Taraweeh prayers (which usually wrap up before 10 p.m.) and dissuade them from protesting against Assad's regime. In some of places TIME visited last Friday during a two-hour drive through the city, it seemed to work. But in many, many others, the protesters braved the shabiha's batons and the security force's bullets. My guides for the evening were two young activists, both business graduates, both 24 and both protest veterans who also help organize gatherings around Damascus. Although there have been a few, isolated and small demonstrations in the heart of the capital, most of the unrest has been along its fringes, in its outer neighborhoods and in nearby suburbs. Loyalists say that is because Assad retains significant support in Damascus, as well as in Aleppo, the country's second major city and its economic powerhouse. Like the capital, Aleppo has yet to dramatically move against the president although there were reports this week of protests and deaths in that city. Anti-regime activists counter that Damascus hasn't decisively moved because of fear  all of Syria's 18 security forces as well as the military are headquartered in the capital. Still, the activists are determined to bring the unrest to Assad's doorstep, and have a strategy to do so. They are organizing so-called tayar or flash protests, events that last less than 10 minutes in suburbs of Damascus that have so far not seen any anti-regime activity. "We keep them to less than 10 minutes so that the security can't catch us," says one of my guides, who wants to be known as Free Damascene. "The aim is to get people to move. If people protest, it will encourage others. Some residents of these areas watch us from their balconies and the women ululate in support. Other people curse us. It doesn't matter, it's a psychological tactic to show the regime that these areas are not as safe as it thinks." They're talking about regions like Mazzeh and Abu Rummane, where they recently held these flash protests. We circle the city in Free Damascene's blue sedan, its tinted windows providing a measure of security. We drive through flashpoint areas like Kafar Sousa, Amiriya, Al-Midan as well as Ghassaniye, a Christian area with no shabiha, because I am told "there are no mosques here." Nationalistic songs blare from the radio. "Syria is with you, Bashar," goes one. Free Damascene turns the song up and winds down his window a little more as he passes a group of shabiha in Kafar Sousa. "Sometimes I talk to the security guys," says his companion, who goes by the alias Honorable Damascene. "I stand with them. They think I'm one of them. They're tired. They haven't seen their families in months." "Yes," replies the driver. "The regime is terrified of us." We continue our drive. "To protest in Mazzeh [an upperscale, largely pro-regime neighborhood of Damascus] is to commit suicide," says one of the young men as he lights up another cigarette and surveys the area. "Look, there's just the one main road," he says pointing to it as we drive along. "There are no small alleys to hide in, nowhere to flee if there's a clash." They look for escape routes. Both young men are upper middle-class secular Sunnis, both say they have no family or personal reasons for being against the regime. "It's just time to be free," says Honorable Damascene. "We learnt from other [Arab] revolutions not to remain silent, and that if we don't take advantage of this opportunity we will remain cowards forever." The pair speak excitedly about where they will help organize protests. There's an infectious energy to Syrian anti-regime demonstrations and a cadence that is all their own. Unlike their counterparts in Tunisia and Egypt, for example, Syrian protesters clap throughout their demonstrations, varying the rhythm and intensity as the chants switch and change. The rallying cry of the Arab Spring, "The people want the fall of the regime," is a favorite, but it's performed somewhat more theatrically here. Protesters first crouch on the ground and whisper the chant, they then repeat it, a little louder, before jumping up, arms thrust in the air as they shout out their demand. The chants are also becoming more brazen. When the anti-regime uprising first erupted in Dara'a in mid-March, the protesters merely wanted the fall of their local governor, a man who detained some 15 children for writing anti-regime graffiti, and reportedly subjected them to torture including pulling out their fingernails. That soon hardened as Assad's security forces shot unarmed demonstrators and stormed Dara'a. The chant then morphed to demand the fall of the regime. Now, this week in several cities in Syria, another modification was heard: "The people want the execution of the President." In another part of town, in a suburb on the outskirts of Damascus, Ali, a 23-year-old activist is helping to organize the following week's protests. Some 80 members of an executive council that is aggregating representatives from different activist groups are voting on a name for the Friday demonstrations. An option needs 30 votes to pass, says Ali, a senior member of the Syrian Revolutionary Coordination Union. "Now it doesn't matter what Assad promises us anymore, we either bring down his regime or he hunts us down, one by one," he says. He's engaged in debate with another activist over Skype. They're tossing around names for this Friday's protest. "How about 'We won't serve in an army that kills us'?" Ali suggests. His friend likes it, but isn't sure it will pass. (The Friday protest is finally called "We won't kneel to anyone but God!"). Flash protests were a key part of the strategy to bring Damascus deeper into the revolution's fold, he explains. "We count on the government coming to those areas [where there have been flash protests], setting up checkpoints, detaining people and generally being annoying, because that will prompt the residents to demonstrate." But isn't that somewhat disingenuous? Won't it create widespread strife? "Nero let Rome burn, but Rome still exists, so I don't mind if Syria burns. We will rebuild the Syria that we want, a Syria that doesn't belong to one man, or to one family. Yes, we are bleeding in these demonstrations, but Bashar is dying." (Read: "Exclusive: A Visit to Hama, the Rebel Syrian City That Refused to Die."